Today I am playing along with the challenges at Clarity Stamps, Sunday Stampers and Country View Crafts. 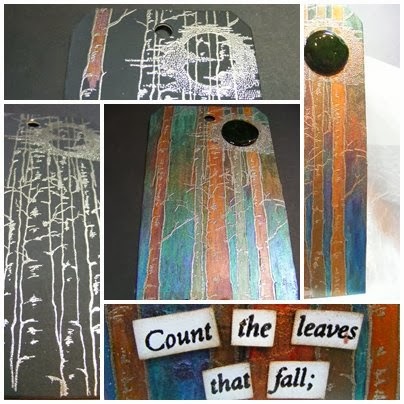 I started with a black Tim Holtz tag and stamped the ‘moon’ and ‘silver birch’ in Versamark and heat set with WOW Platinum embossing powder. I extended the birch and used a Versamark pen to join up the extended trees. I punched out a circle for the moon and coloured this in with H2O’s and used the ‘count your garden’ stamp to cut out the ‘Count the leaves that fall’ words from the sentiment and set with WOW ebony embossing powder. ← Vintage Games and Pink Wings…. Love the techniques you used for this night forest scene. Thank you for linking to Country View Challenges 'Something Spooky' theme.